Wahama sophomore Gracie VanMeter drives to the basket for a layup during a Dec. 29, 2017, girls basketball contest against Hannan at Gary Clark Court in Mason, W.Va.
BELPRE, Ohio — The streak is over. 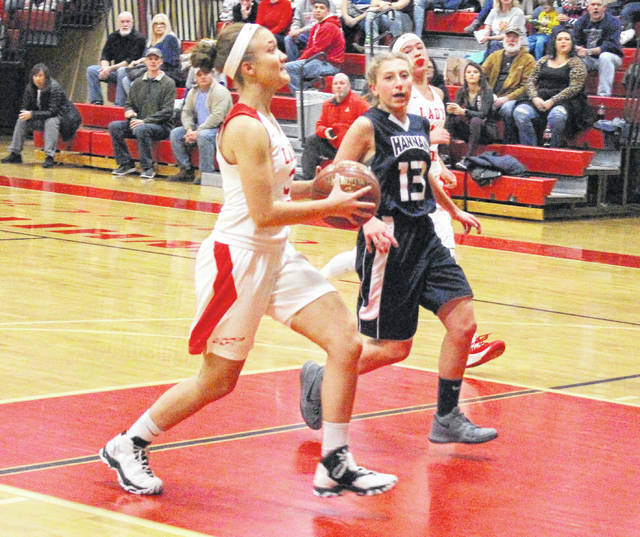 The Wahama girls basketball team had its two-game winning streak snapped on Thursday night following a 61-43 setback to host Belpre in a Tri-Valley Conference Hocking Division contest in Washington County. The Lady Falcons (3-6, 1-6 TVC Hocking) dug themselves an early hole that they ultimately never got out of as the guests fell behind 24-5 after eight minutes of play. The Lady Eagles (7-4, 5-2) were outscored the rest of the way, but the Orange and Black also led by at least three possessions over the remainder of the contest. The Red and White made a 14-9 second quarter run to close to within 33-19 at the break, then went on a 14-10 charge to enter the finale facing a 43-33 deficit. WHS closed the gap down to 43-36 in the opening minute of the fourth, but then lost Emma Gibbs after the freshman was inadvertently hit in the nose during a scramble. Gibbs never returned, and BHS closed regulation on an 18-7 charge that wrapped up the 18-point outcome. The Lady Falcons made 16 total field goals — including two trifectas — and also went 9-of-20 at the free throw line for 45 percent. Gibbs and Hannah Rose both led the guests with 16 points apiece, with Gibbs also recording a double-double with a team-best 18 rebounds. Harley Roush was next with five points and Gracie VanMeter added three markers, while Elizabeth Mullins and Victoria VanMatre completed the tally with two points apiece. Belpre netted 25 total field goals — including four three-pointers — and also went 7-of-18 at the charity stripe for 39 percent. Kyna Waderker paced the hosts with a game-high 19 points, followed by Abbey LaFatch with 13 points and Curstin Griffin with 11 points. Sydney Spencer also reach double digits in the victory with 10 markers. Kyanna Ray was next with three points, while Jaylynn Linton and Hannah Deems each contributed two points. Lakin Hupp completed the winning score with a single point. Wahama returns to action Monday when it travels to Wirt County for a non-conference matchup at 7 p.m.